We imagine a font as a set of shapes. The font gives each logical character some graphic representation. Text editors let us choose the color of our text, i.e. set the solid color to one or more characters. The shape of a character may be very complex, but we are still restricted to a single color for the whole character. The new standard for Color Fonts allows using multiple colors inside one character (more details at ColorFonts.wtf). There are already many fonts in this format. They can be used in Photoshop, Pixelmator, Sketch and other commercial programs. 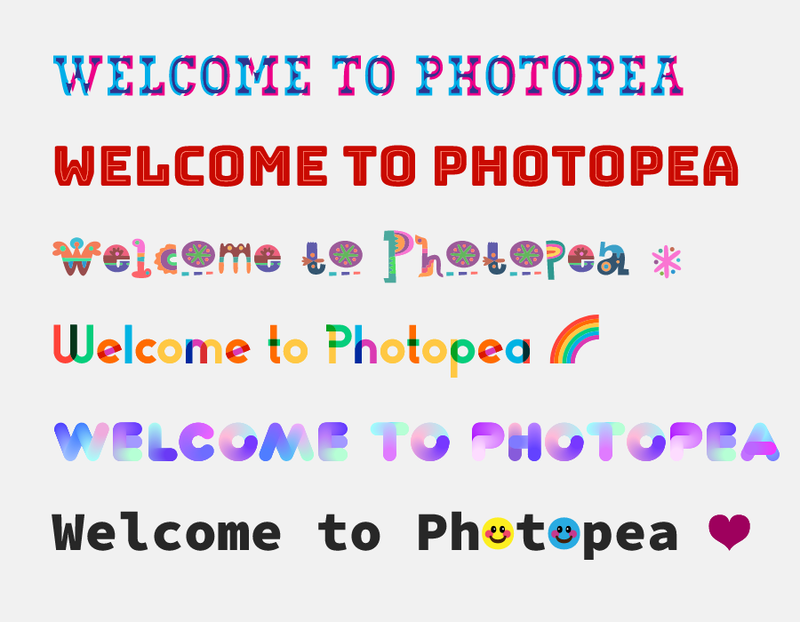 Starting today, you can load and use such fonts in Photopea. PP is probably the first free editor having this capability. Try Color Fonts in Photopea Now! All our effort is available to the public in our open-source library Typr.js.